The neighborhood of Palermo is bounded, in accordance with article 1 of By-law No. 26,607, Municipal Bulletin No. 14,288, published on May 4, 1972, by: La Pampa, Pres. 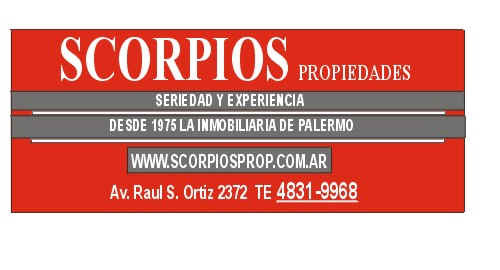 Figueroa Alcorta Avenue, Valentín Alsina Avenue, Zabala, Cabildo Avenue, Jorge Newbery, Cramer, Dorrego Avenue, Córdoba Avenue, Mario Bravo, Coronel Díaz Avenue, Gral. Las Heras Avenue, Tagle, the Gral. Bartolomé Mitre railroad tracks, Jerónimo Salguero Avenue, Rafael Obligado Riverside Avenue. The origin and the reason for the name Palermo given to the neighborhood isn’t quite settled. While some ask themselves whether it bears any relation to the Italian city, the possible origins of the name can be sought with Don Juan Domínguez Palermo, who in the early seventeenth century was the owner of the lands. As places were very commonly named after the churches there or after the saints who were adored, other neighbors hold that the neighborhood was actually called that way because there was an oratory where an image of St. Benito of Palermo was venerated, so that the faithful used to say they were going to see Palermo. Undoubtedly, this was the neighborhood of the Restorer of the Law, Don Juan Manuel de Rosas. Initially, he was the owner of a greater part of these grounds (some 540 city blocks). It was in 1836 that he became the privileged owner of these beautiful grounds, where he decided to build his official residence on what are today’s Libertador and Sarmiento Avenues. But history has its ups and downs and after his defeat on February 3, 1852, in Caseros, Justo José de Urquiza, the victorious general, occupied the residence, which would later become the headquarters of the School of Arts and Trades, of the Military College and of the Naval College. In 1889 the Restorer’s house was entirely demolished to give more air to the park created by Sarmiento, an old political enemy of Rosas. In what used to be the lands of the man who had been governor of Buenos Aires for several decades, the Tres de Febrero park (thus called in commemoration of the date of the battle of Caseros) was inaugurated on November 11, 1875. This is today the site of the great breathing space in Buenos Aires, with 740 acres between Del Libertador Avenue, Salguero, Rafael Obligado Avenue and Pampa. There are found the marvelous lakes and their green spaces, where, every September 21, students gather to celebrate their day, while families take advantage of the spot to take walks along the lovely grounds during the rest of the year. For many years Palermo boasted of the food carts along the riverside Avenue. There one now finds major restaurants with a beautiful view of the river, where Buenos Aires residents and tourists enjoy pleasant evenings and Argentina’s good beef. Also in Palermo is the Spaniards’ Monument, the real name of which is Magna Charta and the Four Regions of Argentina. It is the work of the sculptor Agustín Querol y Subirats and it is given its common name because it was a donation of the Spanish community. It is located on Sarmiento and Del Libertador Avenues. Its materials are bronze and marble, with the final detail of the image that represents the Republic. Palermo Chico is the site of the so-called Barrio Parque, a residential and extremely beautiful spot. Geographically it is located on Figueroa Alcorta Avenue, between Tagle and San Martín de Tours. There one can see large hotels and very well-appointed two- and three-story town houses. The oldest part of Palermo is known, precisely, as Palermo viejo (old Palermo) and it ranges from the rear of Plaza Italia toward the southeast. Its beginnings were as a lower-class outskirt, worthy of tango lyrics and of the pen of writers like Evaristo Carriego and Jorge Luis Borges. Within Palermo we likewise find a beautiful place, in the area next to the Basílica del Espíritu Santo or “La Guadalupe,” which was designed by the architect Juan Beckeert and is built with black marble originally from the old Vienna opera house itself. The floor tiles are German, the stained glass is French, and the remainder of the marble and wood is high-quality Argentine material. Other frequently visited parts of Palermo include the Botanical Garden on Santa Fe and Las Heras Avenues. It has over 17 acres of greenery right in the city and its inventory lists more than 7,000 species. Facing it, we find the Zoological Garden, now known as the Buenos Aires Zoo, on Sarmiento and Las Heras Avenues. It was created at the initiative of President Sarmiento. Since being turned over to private hands on a concession basis, this legendary city zoo has recovered its past brilliance with professional care for the specimens inhabiting it. Among the very special sights that can be seen are the white tigers, of which there are fewer than 200 specimens in the world. In addition to the impressive array and variety of species that live in spots that recreate their natural habitats, the Buenos Aires Zoo also offers specially designed spaces like the bears’ gothic pavilion; the French palace, with its slate roof, that houses the lions, or the 10,000-square-foot reproduction of a Bombay temple which is, obviously, where diverse Indian elephants reside. At one of the most important locations in the city of Buenos Aires, on Sarmiento and Santa Fe Avenues, there rises the legendary Rural Society. Following the signing of the title deed to the lands where the Rural Society is located, the organization undertook an ambitious building project, which has allowed the staging of diverse contests and exhibitions. To such an extent, that the most recent edition of the Book Fair was held in its premises. However, the most famous offering of the Rural Society is the country’s cattle show. It is usually held in the month of July or August and is visited by people from around the country and abroad. The best of the countryside converges on this spot where awards are conferred on the champions of the Argentine farmlands.